Stay healthy with care from San Marcos Gentle Dental! 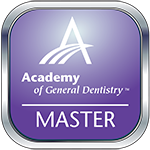 At San Marcos Gentle Dental we provide complete family and cosmetic dentistry. Our state of the art dental office helps take the apprehension out of going to the dentist. It is essential for us to know and understand your concerns, fears and dental expectations; these concerns will be handled with the utmost care and will be considered a standard for service. Our office offers a range of services, designed to make your visit a comfortable success. Because of Dr. Donnelly’s extensive training in a myriad of dental disciplines, all of your dental wants and needs can be satisfied without the need of several specialists. Dentists take x-rays because only so much can be seen with the naked eye. But thanks to the clarity and detail of digital x-rays, our San Marcos team can provide patients with more accurate diagnoses and better overall care. Using the clear images produced by our digital x-ray device, Dr. Donnelly can help you better understand your smile and what kind of care it needs to be healthier. Thinking of having dental treatment done but you are not sure how it will look afterward? With our imaging system we can show you what your smile will look like after treatment. We take a picture of your smile, download it into the computer and, with just a few minutes of work, your new smile will appear. 3D digital x-rays, also referred to as Cone Beam CT imaging, are essentially 3D images of the mouth and jaw that can be manipulated to better plan for implant placement, oral surgery procedures and TMJ. The state-of-the-art scans are accomplished in our office in a matter of seconds. They allow us to know more about your anatomy during the planning phase, so that we can perform less invasive procedures. We have invested in this technology to better serve our patients, and provide the peace of mind that our diagnosis and treatment plans are based on the most comprehensive information found in dental x-rays today. The 3D digital imaging uses at least 10 times less radiation than traditional medical CT scans. Who would have thought that you could go to the dentist without needing needles or drills! With the Whisper Jet decay removal system, needles and drills are no longer necessary when filling your small to moderate cavities. The Whisper Jet decay removal system uses high-pressure air and powder instead of drills and most often anesthesia is not required. Besides using the latest radiography tools to capture images of your teeth, gums, and jaw, our San Marcos team also relies on Nikon cameras to document your treatment. The images we take with these cameras will help us see what kinds of care you need and will help us monitor your progress and plan your future. Thanks to advances in dental technology, we are now able to detect hidden tooth decay and remove it before it destroys the tooth. The Diagnodent is a small, pen-like laser, which scans the teeth with a harmless light checking the health of the tooth. This great technology is completely safe and pain free. Cavitron is an ultrasonic scaler that lets us remove staining easily during teeth cleanings. Staining builds up over time, as bacteria and plaque accumulate around the gum line. But with the power of Cavitron’s high frequency signal, in combination with its water feature, we can wash away this buildup to reveal healthier, better-looking teeth. Do needles make you nervous? We are proud to offer the most high tech care available in dentistry today, including The Wand. The Wand is a computerized device that controls the flow of the anesthetic, which makes for a more comfortable dental experience. Part of providing excellent care is making patients feel comfortable. One way we can do that is by offering chairside satellite radio. Instead of listening to the sounds of our office while we work on your smile, you can put your mind at ease and watch the time go by while you listen to your favorite stations. Helping you understand your oral health is very important to us. To help us accomplish our mission, we use chairside monitors. With these monitors, it’s easier for us to point out areas of concern so that you can more fully understand how we can help and what your procedure will involve. Is anxiety keeping you from seeking important dental care? To help you enjoy comfortable care, we offer nitrous oxide with every appointment. This patient comfort, commonly known as laughing gas, works fast to dissolve stress so you can rest comfortably during your appointment. Afterwards, it wears off quickly, allowing you to drive yourself home, to work, or wherever you need to go. What's more, Nitrous oxide is effective or patients of all ages. We now offer the latest in CAD/CAM technology to our patients. In order to provide our patients with an optimal experience we no longer need to take impressions using messy impression material that can often be uncomfortable and affect your sensitive gag reflex. The system uses a high speed laser that actually captures the dimensions of your tooth and then is sent to the design center to either be forwarded to a lab or to create your crown in our office. This technology allows for better accuracy in all dental impressions and saves you time so you can have your new crown completed in one appointment. 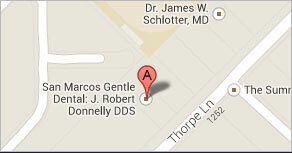 Please call us today if you would like to schedule an appointment at San Marcos Gentle Dental. 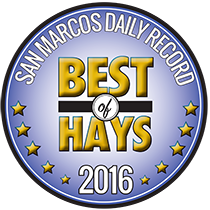 Dr. Donnelly treats patients from San Marcos, New Braunfels, Wimberley, Kyle, and the surrounding Texas towns for examinations. If this is going to be your first exam at San Marcos Gentle Dental, we ask that you please briefly review our new patient information, which we have listed for your convenience. To learn about ways we can help you better your oral health, simply take a look at our complete list of dental services. Our friendly team is ready to help you improve your smile!